This pattern is intended to be used with knit fabrics. It was designed on wool jersey. You can use a woven fabric for the cardigan or the top's front or back, as long as it's combined with knit sleeves. 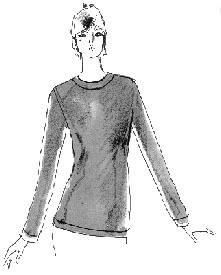 The higher armhole of this pattern and slight waist shaping is unusual for a knit pattern. No more frumpy knits--this is the modern way to look casual. Another great way to short cut a matching suit is to use your skirt or pant fabric for the front bands and pockets of the cardigan. Since the front band is a long straight piece, it's especially well suited to a contrast woven fabric. The neckband is cut on the straight of grain so you use a stripe or rib pattern without distortion. You can insert piping next to the band to coordinate the sweater with a skirt or pants too. "I have made the top in evening fabrics with knit neck and wrist bands, by cutting down the neck edge slightly. The cardigan is magnificent with a lace front and wool jersey body with matching wool jersey pants from pattern #1961. You can quickly make dozens of these pieces, and the cardigan makes a great gift. These are comfort clothes". You'll find suitable knit fabrics in the fabric area labeled "Knit Tops." faithfully. I wish more pattern companies understood how to make a flattering fit knit pattern. All yardages given are given for 60" fabric using a "with nap" layout. Sizes 8-12 1 3/4 yd. Sizes 14-18 2 1/8 yd. Sizes 8-12 1 5/8 yd. Sizes 14-18 1 7/8 yd. Sizes 8-12 1 3/8 yd. Sizes 14-18 1 5/8 yd. Scalloped Lace - all sizes 7/8 yd. All sizes 1 5/8 yd. All sizes - 1 3/8 yd. Description: Misses semi-fitted cardigan in two lengths has a natural shoulder, separate self-fabric neck/front band and cuffs. Pullover top in two lengths is semi-fitted with stitched hems and self-fabric neckband. 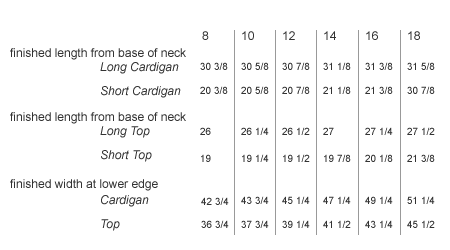 Cardigan may be made with lace or woven fabric fronts and/or front bands and pockets. Fabrics: Cardigan: Wool, wool blend, cashmere, cotton, or rayon jersey or doubleknit. Lace front should have scalloped edge and be re-embroidered/corded lace with body, or wool lace. 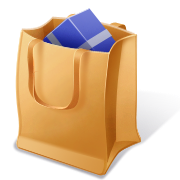 Fronts may also be made of woven fabrics. Top: wool, cashmere, wool blend, cotton or rayon jersey or lightweight doubleknit. Notions: Shoulder pads (optional), five 3/4" buttons for the cardigan. Interfacing: Tricot type interfacing for the cardigan front bands (1 yard or one length of 60" wide) and either Fusible Underlining, Fusi Knit or So Sheer for the pockets.